My friend Ann introduced me to the comedy of Eddie Izzard a number of years ago, and from the moment she turned on his Dress To Kill, I was in love. He’s comedy gold to me. 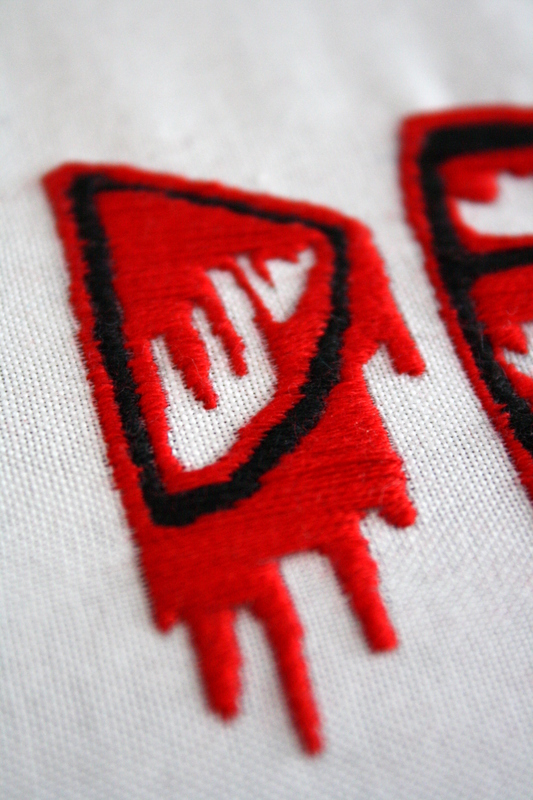 Someone on Flickr had used an awesome blood-drippy font on a project, and I instantly knew how to design this. 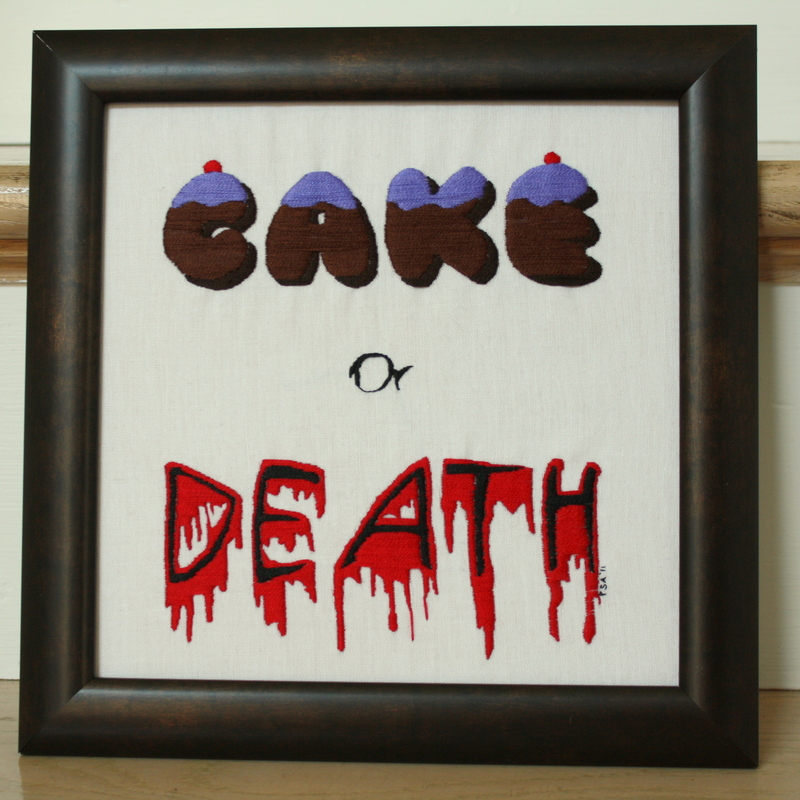 Simply “cake” and “death.” Pretty straight forward, really. 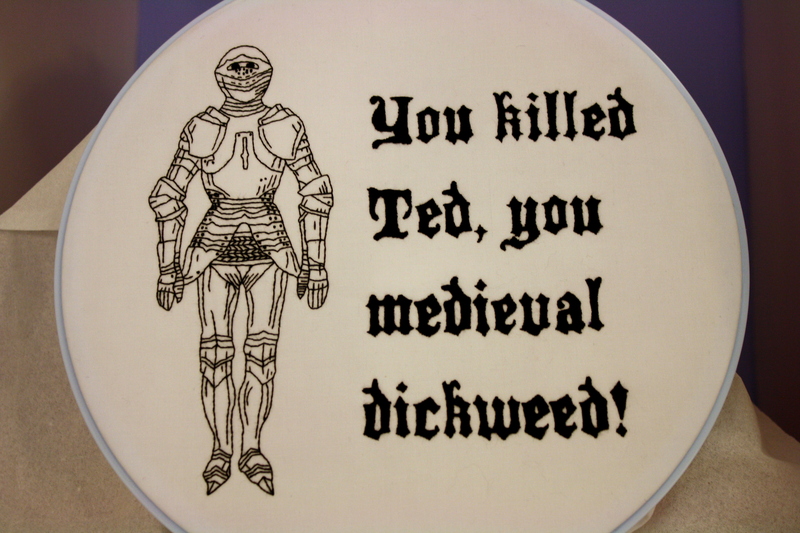 Of course, there are so many other great lines from Mr. Izzard that I could be kept busy just embroidering all of them. 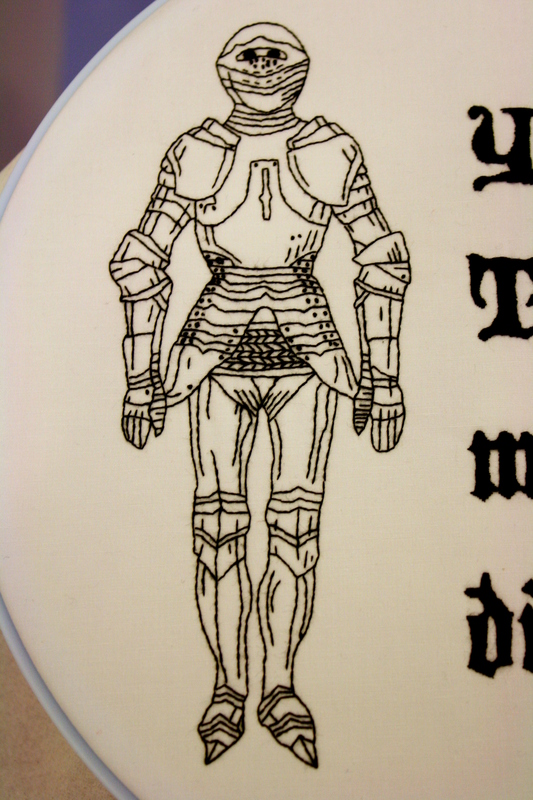 The piece is done entirely in satin stitch. I was very happy with how it turned out, and by looking through my past pieces, I can see that my satin stitch has improved roughly 1000 percent. It’s been a while, huh? Well, fear not, I’ve still been around stitching. There just hasn’t been much will to blog. That’s changing, I assure you. So while I have not one, not two, but three (3!) pieces going at once right now (I NEVER have more than one, as I like to make sure they get finished), I can give you a sneak peek at the one that should be finished first above. Yes, that’s a letter D dripping in blood. What’s it to you?! And to prove that I haven’t been all lazy, here is the piece I created for the last Phat Quarter swap, themed “music,” and the most amazing piece that I received in return. Have you heard that there’s a potential third Bill and Ted movie in the works? I’m a huge fan of the original (and yes, the sequel had some decent moments), and the news got me thinking about just how great a movie Excellent Adventure is. One of my favorite moments is when the boys meet the princesses and play around in authentic armor. Bill accidentally pushes Ted down a flight of stairs, and when he gets down to the bottom of the stairs, he finds another knight pushing a sword through Ted’s armor. No worries, though – Ted rolled out of the suit as he fell down the stairs. I get a lot of my inspiration for embroideries from song lyrics and poems. 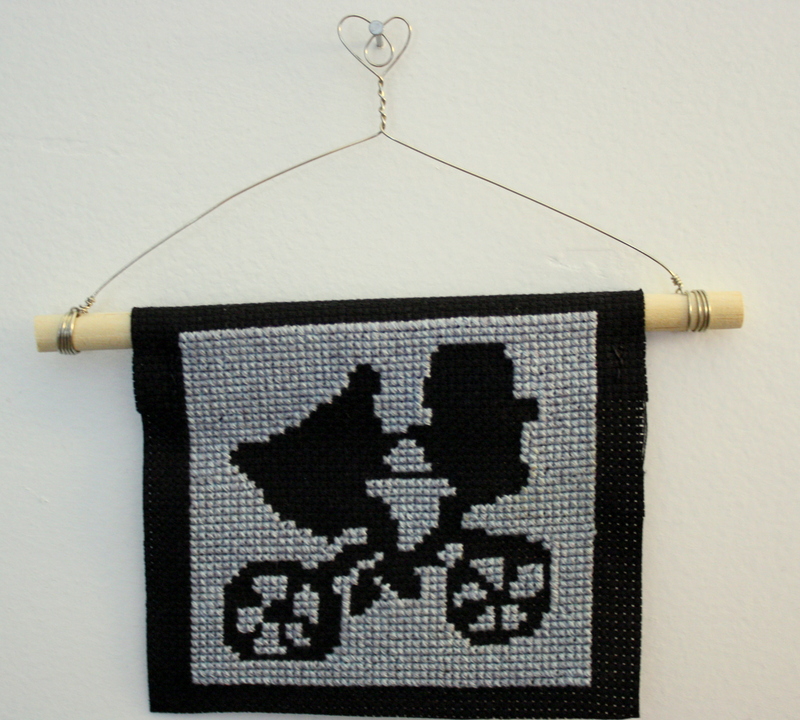 So when I saw Checkout Girl’s contest back in July, entitled “Embroidereading,” I knew I had to submit something. I thought long and hard on this, and while I’m often inspired by words and even use words in many of my pieces, I was having a hard time thinking of a specific quote that I wanted to immortalize. 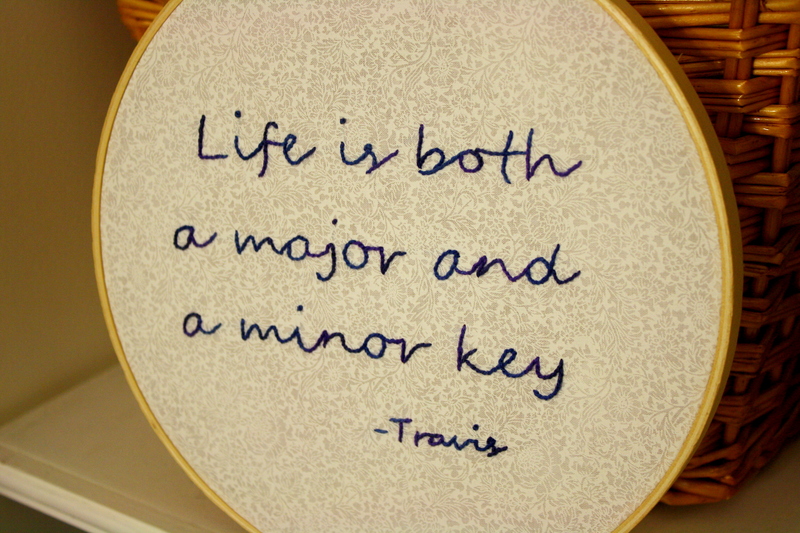 I eventually came up with one of my favorite quotes from the Travis song “Side” – “Life is both a major and a minor key, just open up the chord.” I shortened the line, though, which I think makes it a little more bittersweet. It’s a bit hard to see in this picture, but the cotton floss is variegated in blue and purple – it was my first time using variegated floss, but I liked the effect and look forward to using it again. Because the script (embroidered in my strange variation on back stitch) is fairly simple, I used a lightly patterned white cotton for the background. The flower details on the fabric are much more visible in this picture than in reality. Halfway through stitching the Travis piece, though, real inspiration struck. I read Catullus in Latin class in college, and he quickly became my favorite ancient poet (because yes, I’m the kind of girl who has a favorite ancient poet). His poems are known by number, and 64 (LXIV if you’re as geeky as me) is known as his “little epic.” Little because, at just over 400 lines, this poem can’t even hold a candle to true epics like Virgil’s Aeneid (which is 12 BOOKS or roughly 10,000 lines). But what the poem lacks in length, it makes up in strength and impact. It tells the story of the wedding of Anchises and Thetis (Achilles’ parents), including a lengthy description of the embroidered coverlet on their wedding bed, which shows Ariadne after she was abandoned on an island by Theseus. I especially liked picking this poem because the subject is something embroidered. 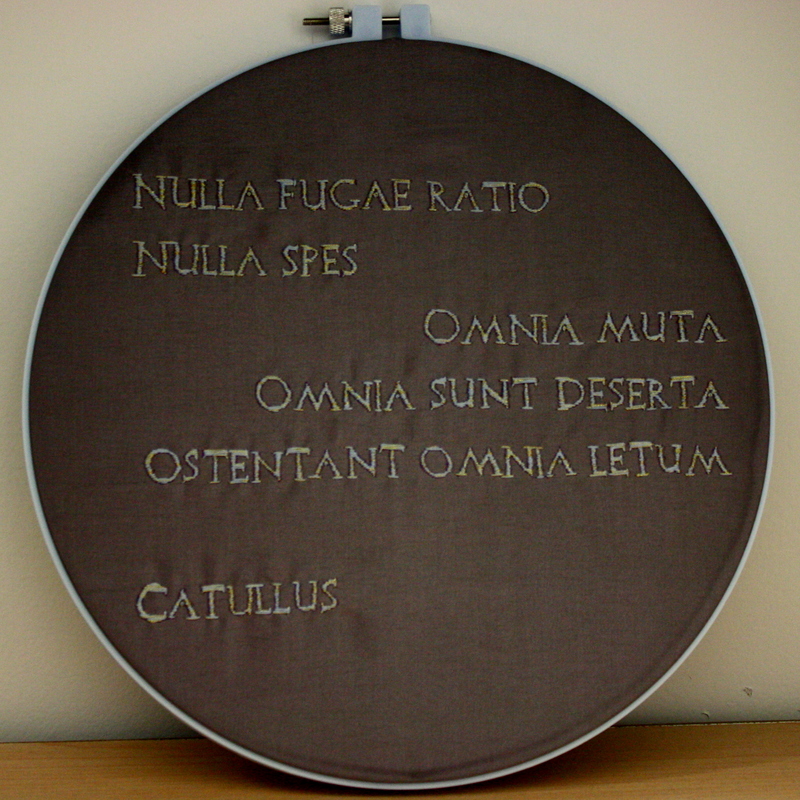 I picked my favorite lines from 64 – “Nulla fugae ratio, nulla spes. Omnia muta, omnia sunt deserta, ostentant omnia letum.” They’re horribly depressing lines, used by Ariadne to describe the bleak landscape she has been left on – “There is no means of escape, there is no hope. All is silent, all is deserted, all speaks of death.” I didn’t choose it because it was so depressing but because I love the repetition of the “nulla”s and “omnia”s. I wasn’t entirely thrilled with how this one turned out. I was a bit rushed to get it in before the contest’s deadline, and in fact, this is the second version of this that I made. I was an idiot on the first one and made a huge mistake. I used a dark heather gray wool and thus couldn’t draw the design on, so I put the design on some tear-away interfacing and started sewing. The embroidery turned out perfectly, and I loved what I thought it was going to look like. When it came to removing the interfacing, though, it just wouldn’t pull away. My stitches started pulling and warping as I tried to carefully remove it with tweezers, and after trying to clean up a tiny section for a few hours, I gave up and decided that a second embroidery was a better bet. I opted for a shiny purple/gray fabric that pulled more than I had hoped, and I used a combination of light blue cotton and gold metallic floss to produce a bit of a variegated look (that’s the one part of this that I’m really happy about). I still have my first embroidery, and if I get bored sometime this winter, I may give cleaning it up another try. A detailed shot, where you can see the variations in the floss, is here. 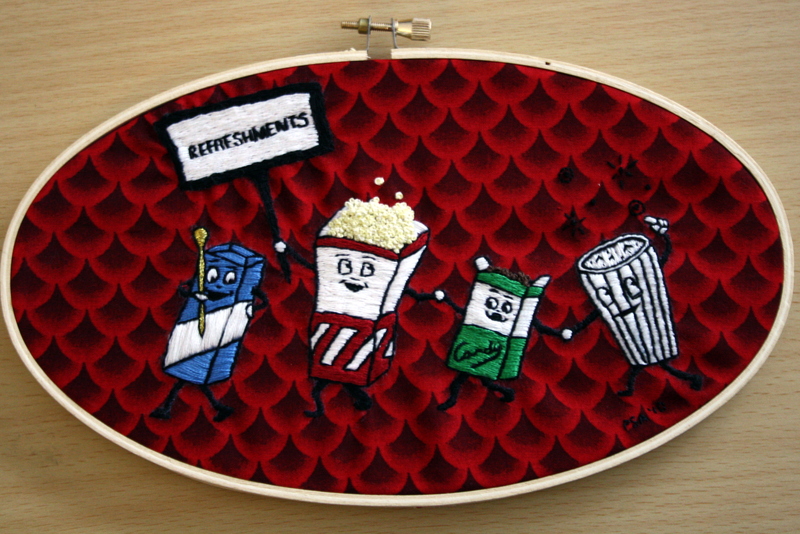 Edit: I didn’t win the Embroidereading contest, but I’m not surprised, considering how great the other entrants were. Luckily, the Embroidereading Flickr group is being left open as a gathering place for all embroidered quotes. Check it out – I’m in love with the concept and am sure I’ll keep adding to the group. One of the big things that has gotten me so enthusiastic about embroidery is the needlework groups I’ve found on Flickr. I like the setup of Flickr for these communities better than discussion boards because it’s built around the image – the thing you’ve made – rather than the words. Ask a question and you’ll get answers, but I’ve found that the best way to learn this art is to pay attention to what other people are doing, and their pictures are a perfect way to do this. 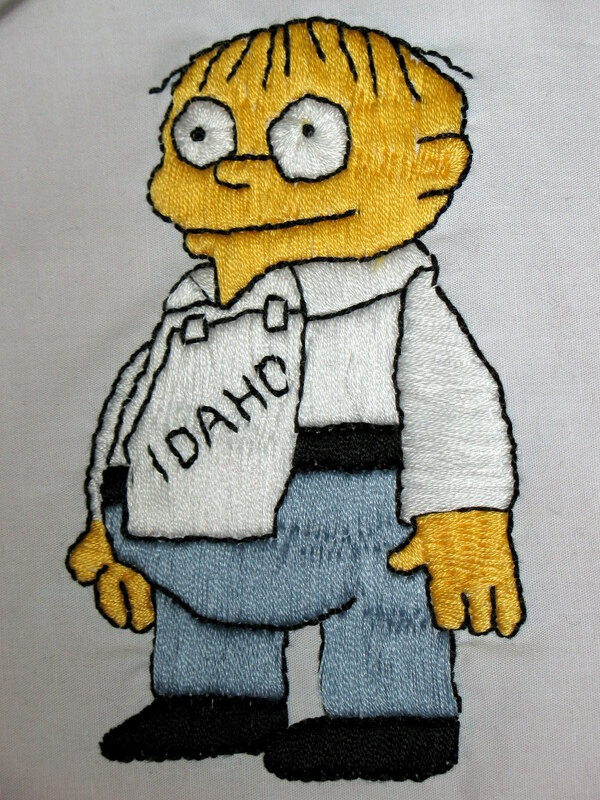 My favorite group right now is Phat Quarter, which is the Flickr pool for readers of Mr X Stitch. The people posting in this group are just my kind of people – they’ve all put their own modern spin on embroidery, and I love almost every piece that gets posted. So last month, when the details for a Comic/Cartoon-themed swap were announced in the Phat Quarter group, I signed up before I could realize that I didn’t know the first thing about swaps. No worries – swaps are just what they sound like. You make something and put it in the mail to someone else. You get something else in return. Easy. I ended up mailing this Tick piece off to Giddy Girlie, who herself makes amazing pop culture pieces (not just embroidery, but paintings and more!). The piece I got just came in and I’ll post about it soon. Why the Tick? It was one of my favorite cartoons when I was a kid. I think it was on when I was in middle school, and I used to quote it daily (I still quote it, just not that often). My favorite line is “Today is my birthday – I think I’ll celebrate by inventing agriculture.” The live-action show that was on later was short-lived but fantastic – you can watch it on Hulu. 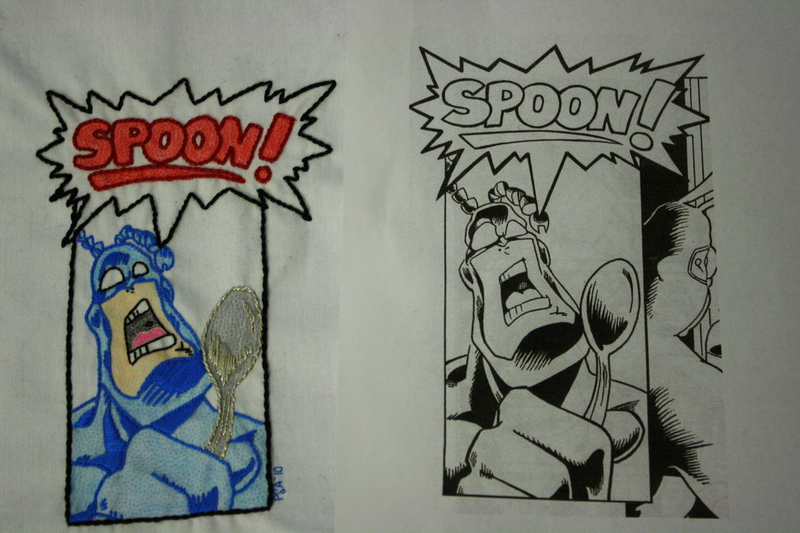 There are just so many amazing moments, and I went with the iconic moment when the Tick chooses his battle cry – Spoon! For this piece, which is about 5×7, I used crayons to tint the fabric, then used satin stitch and my own weird version of outline stitch* (there are a few stray straight stitches and French knots in there too). I’m really happy how he turned out, and I’m feeling like I might need to make another one just for me. *I say my own version of outline stitch because I kind of figured out how to do it on my own and it’s more of a back stitch than the real thing. I’m a big Simpsons fan – have been since the beginning. Back in 1989, my brother was home from college for Christmas, and we watched the then-new show together. (Years later, I watched reruns of the Tracy Ullman show all the time and loved the original Simpsons shorts.) The Simpsons are so ingrained in my upbringing – quotes, sight gags, situations – that I can tell when I’m talking to someone who hasn’t watched the show much because they can’t follow what I’m saying. Did I mention that I taught a class on the show (not once but twice) while I was in college? Anyway, Ralph Wiggum has always been one of my favorite parts of the show. I even quoted him in my high school yearbook (“Go banana!”). He’s such a misfit, and I just love him. After my first little embroidery kit from Michaels, filled with stem stitch and satin stitch that never came out quite right, I was a bit scared of those two stitches. I decided to grab my fear by the horns and do a piece entirely in satin stitch. I didn’t master the technique with Ralph here, but I got a much firmer grasp on the concept. It doesn’t scare me quite so much anymore.